1.Two pieces semi rigid collar, Velcro encloures made of EVA sheet. 2. Rigid plastic reinforcement in both pieces with tracel opening. 3. No metal parts, X-ray can be taken easily. 4. 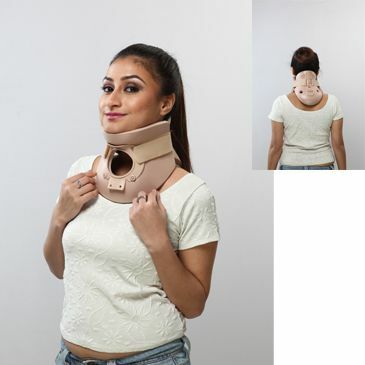 Shaped for complete immobilization of cervical region. 3. Early rheumatoid diseases of cervical region. 4. Stabilisation or hyperextension of cervical region.